I remember a time that winning meant something. It started with team sports as a kid with winners getting Dairy Queen and Pizza Hut and losers going home hungry, but it progressed to winners getting trophies and losers going home empty handed. 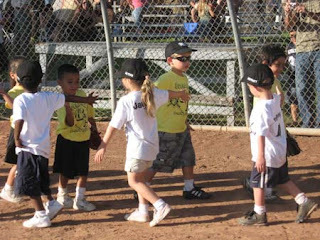 I may be showing my age here, but I was not a member of the "everyone gets a trophy so no one feels bad" generation. If you didn't win, you tried harder, you pushed your teammates to the brink to win, or you were a loser. Plain and simple. You had heart and pushed to win or you failed and lost. Being a winner was hard work. It required dedication, stamina and the desire to win. If you area winner, you are a champion- you are the very best, you have the attitude of a champion - win or lose. 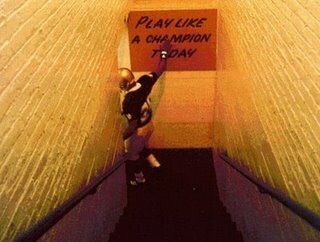 At the University of Notre Dame, there is a no frills hand painted sign in the stairwell posted by Lou Holtz. It simple says, "Play Like A Champion Today." The players all hit the sign on their way to the field, promising themselves and their team that no matter what, today they are going to give their all. After living in Indiana for years, this motto was everywhere and it started to sink in. Maybe my black and white view of what a champion is was wrong. Maybe, just maybe a champion can lose. Maybe you can win a game and *not* be a champion. A trophy or ring is not the sole sign of a champion. It may be a step in the right direction, but it is not the single determining factor. Take for example high school track runner Megan Vogel. She was nearing the finish line of her race and competitor Arden McMath collapsed on the track in front of her. Vogel had a choice, run and finish the race, knowing that if her competitor had not fallen, she would have run, or so something different. Vogel stopped and lifted McMath and carried her across the finish line. Does that move make Vogel a champion? The true worth of a champion is not based solely on the scoreboard. It is how the game is played - never taking a game off, never quitting.